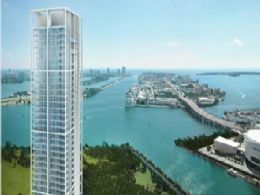 The 900 Biscayne Bay edifice is currently earning some of the most positive word of mouth since ICON Brickell in downtown Miami. Standing at an imposing 60 stories, 900 Biscayne Bay will overlook virtually every delightful inch of the city of Miami and its brilliantly vivacious yet blissfully serene waters. Its residences are being touted as some of the most "livable" in ages and inside the building will be an unheard of 50 seat theater. When its doors open later this year, 900 Biscayne Bay will stand as yet another gorgeously optimum testament of Miami’s immaculate architecture and sumptuous residential accommodations. 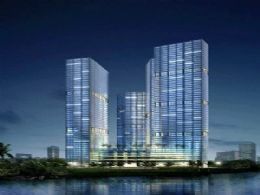 In addition to its fifty seat theater with 5.1 sound, 900 Biscayne Bay guests and residents will be greeted by a glorious three story lobby complete with its own lounge area. A spacious and relaxing pool deck is large enough to accommodate large crowds, making it ideal for gatherings or events. Catering services are additionally provided to residents who seek to make use of the pool deck for such an occasion. The theater area is complemented by comfortably plush seating and will contain a variety of original art pieces. An outdoor café and restaurant and a monstrous 80,000 square feet of office space offering views of the Performing Arts Center will further add to 900 Biscayne Bay’s desirability. A yoga and aerobics studio, state of the art fitness equipment, sauna and separate locker areas for both sexes will appease the health conscious. After the strenuous workout, indulge in the Whirlpool spa and temperature controlled pools while gazing at the wonderful views of the city and bay or the building’s beautiful gardens. All this excitement is pleasantly rounded out by the around the clock cutting edge security technology and staff and professional concierge. The residences at 900 Biscayne Bay will be comprised of a variety of eleven unique floor plans that are being positively spoken about and come in one to three bedroom options. Inside you’ll find tinted sliding glass doors, private terraces, sophisticated fire safety systems, and roomy walk-in closets. Kitchens are designed in a European style and feature a number of stainless steel Miele brand appliances and stone countertops. Bathrooms come with opulent whirlpool baths and attractive stone interiors. Its prime location in downtown Miami allows convenient access to the area’s most renowned attractions like the American Airlines Arena, a colossal complex that hosts the city’s major musical and sporting events. The Carnival Performing Arts Center is one of the city’s more recent unveilings and is host to frequent performances by the prestigious Miami City Ballet in addition to numerous plays and musical performances. Take a short five minute drive along the causeway and you’ll hit Miami’s infamous and always stylish South Beach, the quintessential hotspot for the best in dining, shopping and invigorating nightlife.